IMPORTANT NOTICE: Attached resumes will not be reviewed or considered. You are required to include your work experience in the Work Experience section of your application. If you have previously included work history on a resume you must transfer your work history into the Work Experience section prior to submitting your application. For more information please visit our website: Employment with the State of New Mexico. This position resides with the New Mexico State Library – Rural Bookmobile East in Tucumcari, New Mexico, delivering library services to rural and underserved communities in eastern New Mexico. This position is responsible for driving a 35-foot bookmobile to designated rural areas, providing a full range of library services including a circulating collection of books, magazines, and audio-visual materials, reference services and Interlibrary Loan. 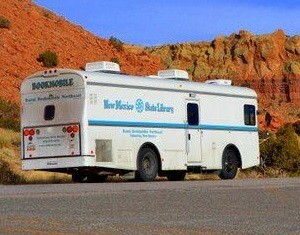 Employee supports all aspects of these services both on the Bookmobile and in the Tucumcari office. Enters data in automated library computer system, maintaining patron records, copy-cataloging and processing new materials, ordering and processing Interlibrary Loans, selecting new materials, and statistical record keeping. physically assists patrons getting on and off of the bookmobile and their heavy book bags, ensuring patron safety. This is a supervisory position. This position will not be paid above the mid-point of the Pay Band. This position is a 70 Pay Band. A Bachelor’s Degree in any field of study from an accredited college or university and four (4) years of professional level experience operating within limited parameters and guidelines directly related to the purpose of the position defined by the agency at the time of recruitment. Any combination of education from an accredited college or university and/or direct experience in this occupation totaling eight (8) years may substitute for the required education and experience. A hiring agency will designate a portion of the required experience to include supervisory and/or specialized experience. Any required licensure, certification or registration shall be defined at the time of recruitment and will be in addition to the above requirements. Employment Requirements: Employee is required to travel overnight two to three days during two to three weeks each month. Successful candidate must complete state offered Defensive Driving course prior to operating state vehicle. Must possess and maintain a current and valid Driver’s License. Successful candidate will be subject to background check. Employment is subject to a pre-employment background investigation and is conditional pending results. Statutory Requirements: If a Statutory Requirement is associated with a position in this Manager Category, it will apply.